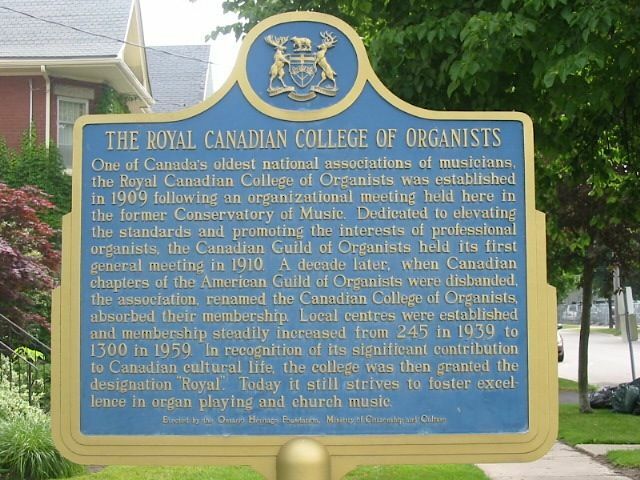 One of Canada's oldest national associations of musicians, the Royal Canadian College of Organists was established in 1909 following an organizational meeting held here in the former Conservatory of Music. Dedicated to elevating the standards and promoting the interests of professional organists, the Canadian Guild of Organists held its first general meeting in 1910. A decade later, when Canadian chapters of the American Guild of Organists were disbanded, the association, renamed the Canadian College of Organists, absorbed their membership. Local centres were established and membership steadily increased from 245 in 1939 to 1300 in 1959. In recognition of its significant contribution to Canadian cultural life, the college was then granted the designation "Royal". Today it still strives to foster excellence in organ playing and church music.